How to Reach Wonderla Hyderabad? How to play safely at Wonderla Hyderabad Amusement Park? Senior citizen ticket prices are applicable to guests above 60 years only upon showing original govt photo ID proof with date of birth for age verification. A minimum of 20 students from a single institution are needed in a group, and authorisation letter from the head of the institution need to be submitted to avail the discount. Wonderla Amusement and Waterpark is undoubtedly a place of unlimited fun and boundless entertainment. Bestowed with Certificate of Excellence – 2015, Wonderla has been maintaining international standards of facilities along with an extensive array of dry and water rides and games, since its day of inception. One of the best entertainment parks not only in India but in Asia too, Wonderla Amusement and Waterpark is now opened in Hyderabad as well. 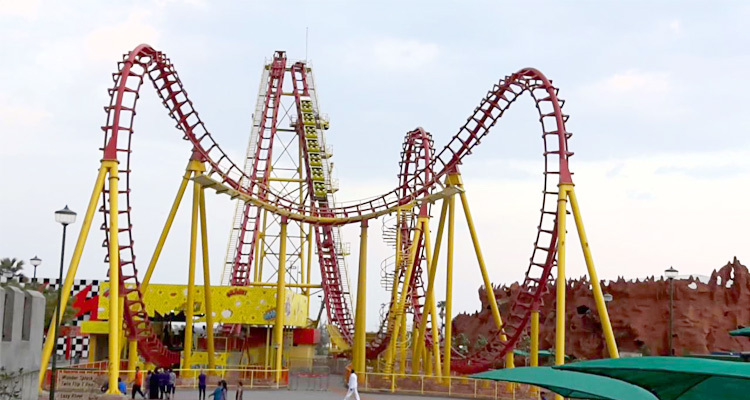 Other two Wonderla parks are located in Bangalore and Kochi. Wonderla Hyderabad Amusement & Water Park had been opened for public now, before than the previous estimation according to which this amusement park was to be functional and open to public by 2017. It is now open, promising visitors with a range of thrilling rides and other entertaining activities. It is calculated that a cost of over 2.5 billion has been invested for the construction of this amusement park. It is located in Kongara Khurd A Village, Ravirala Post, Maheshwaram Mandal. Synonymous to entertainment, WonderLa amusement park promises a memorable trip to everyone. Its state-of-the-art land rides and thrilling water rides, gives an experience that is unmatched to any other. An amazing range of water rides, dry rides along with high thrill rides and dedicated rides for kids, keep every visitor happy and thrilled. There are around 43 thrilling rides to keep every visitor allured. Along with this, excellent dining choices and a wide array of facilities make the experience even better. Whether you are looking for a luxurious stay or a fun filled day tour, Wonderla Amusement and Water Park in Hyderabad will be an apt destination for all kinds of holidays. From a relaxed time with your family to a stimulating experience with friends, Wonderla Hyderabad is ideal for everyone. Wonderla Hyderabad has 43 unique rides for visitors to enjoy. There is a varied array of rides including dry rides, water rides, especially designed rides for children and family rides as well. For those who seek adventure and are crazy for adrenalin rush, high thrill rides are the most suitable way to spend their day at Wonderla Hyderabad. Recoil- This ride takes twists and turns in unexpected way, even a flip at a speed of 77km/hour in reverse, leaving you thrilled throughout. Maverick- Living up to its name, this ride offer thrill with its eccentric turns in every possible direction while it is hinged to a vertical column. It has seating capacity of 21. It is not advisable for patient with heart problems or high blood pressure. Equinox- Here riders are seated on suspended seats with lock sensor and they are given thrilling forces from every possible side and moved in every direction, including turns, rotations, upsides and downside and swings. Techno Jump- This is a ride that even thrill seekers will remember for a long time. In this ride, there are 14 spokes, each with a capsule to seat three which is moved upwards and downwards hydraulically along with spins. It is not recommended for those with high blood pressure or heart related issues. Twin Flip T Rex- This ride has two robotic arms with three capsules that spin and swing along with moving upwards and downwards. The experience is nothing less than a being amid a whirlwind. Space Jam- This 18 seater rides moves you in clockwise and anticlockwise direction with sudden accelerations and drops. Wonderla Hyderabad has many interesting rides that families can try together. These family rides let you have maximum fun with your loved ones. Nothing is better to beat this summer heat than having a thrilling rejuvenating experience while trying a few water rides. These are best rides for all those who love to play in water and yet wish to have something adventurous. At Wonderla Hyderabad Amusement Park, there are a wide arrange of rides which have been especially designed for kids, keeping their interests and safety in mind. Wonderla Hyderabad is open from 11 AM to 6 PM on the regular days (Monday to Friday). On peak days including weekends (Saturday- Sunday) and public holidays, the opening timings are from 11 AM to 7 PM. Wonderla Hyderabad Amusement park entry fee varies from weekdays to weekends and on peak season. During Ramzan, Dasara and Christmas which is the peak season, the ticket charges of Wonderla Hyderabad varies from the regular charges. Visitors can choose from regular tickets and fastrack tickets. The entry fees of Wonderla for Normal tickets on regular days (from Monday to Friday) is Rs. 770 per adult and Rs. 620 per child plus taxes. For Fastrack ticket, the entry ticket is Rs. 1,290 per adult and Rs. 1,025 per kid plus taxes. On Peak days, weekends and public holidays, the entry fee of Wonderla Hyderabad Normal ticket is Rs. 990 per adult and Rs. 810 per kid plus taxes. For Fastrack tickets on peak days, the entry ticket is Rs. 1,650 per adult while for kids it is Rs.1,350 plus taxes. Wonderla ticket price for college students on weekdays (Mon - Fri) is Rs. 810 per student. On Weekends and peak days, ticket charges for college students is Rs. 940 per student. Wonderla also offer discount of upto 35% on ticket price for school students with a minimum of 20 students in group. Note: Authorisation letter from the head of the institution is mandatory to avail the school students discount at Wonderla Hyderabad. Check more details for School Students and College Students. What make Wonderla Hyderabad Amusement park even more enjoyable are the extensive range of facilities that are offered here. Some of the facilities that are provided here are Lockers, Dress changing rooms for males and females separately, Drinking water, ATM counter, cloakroom, ample of parking space, designated areas for smoking, phone facility, lost and found counter, availability of wheelchairs and prams and in case any emergency even first aid facility is offered. Wonderla Hyderabad presents more than rides and thrill; it is an ideal place for food lovers too. With a wide array of restaurants, catering to every visitor and their varying preference, it presents ample of choices to treat your palate with. From snack counters to all inclusive food court, coffee shops to fine dining restaurants, you can have a relaxed and fulfilling dining experience after the exhilarating time at rides here. Food court at Wonderla has an extensive variety of culinary choices, varying from ice creams, chaats to Mexican and Italian, Chinese, South and North Indian delicacies. Along with food court, there are restaurants such as Park View Restaurant offering South Indian delicacies and Chillies presenting mouth-watering South Indian and North Indian cuisines. If you are looking for international cuisines, then the restaurant Waves is the place to be. Wonderla Amusement Park also presents a range of offers and Wonderla Hyderabad packages making it possible for everyone to have a hassle free access to the entertainment park. For instance, Wonderpass is an ideal option for those who visit the amusement park regularly. There are two kinds of Wonderpass offered at Wonderla namely Gold card and Blue Card. Gold Card is valid for a period of 1 year with unlimited entry to the amusement park. It cost Rs. 4, 499 while Blue Card, which cost Rs. 2, 499 offer free entry for a number of four times. It is valid up to 1 year as well. There are also various other packages such as Hall ticket offers, packages for college students, corporate, groups and school students. Student of 10th and 12th standard from anywhere in the country can avail hall ticket offers by showing their hall tickets. This presents a refreshing break to students after the exams pressure.